Best Windows 10 Skins – Themes for Windows 7/8.1/10 . Since Windows XP, Microsoft made many changes in Windows Design and user interface. And there is no doubt, that Windows 10 is best Windows of Microsoft till now. Recently, Microsoft launched new Windows update, If you want then you can Install Windows 10 Creators Update. Although Microsoft didn’t make UI changes in this update. Windows 10 already looks dope, But still, you can make Windows look better, by Installing Windows 10 skins or themes. Windows comes with Personalize option, Which allows to change the background and apply some themes. Although all themes available in personalizing settings, Is somehow similar to each other. These themes only change background and color of the taskbar. But If you want to completely customize or want to change Windows look then you can Install skins. Note: If you’re an Android user then you can Install substratum Android theme engine and can Apply themes. What are Windows 10 skins?. And what it does?. Windows 10 skins are a personalized program of Windows, Which can Change Windows look completely. It is somehow different from Windows themes Because with skins you can change or install themes, icon pack, UI design. Officially Windows Store does not provide skins, You need to Install skins from third-party sites. And If you don’t want to use third-party skins, then you can try some Official Windows 10 themes. Right Click on the desktop and select Personalize option. Now from the Right sidebar, you can select theme option. Here you can find out some Downloaded themes but if you want more themes then click on “Get more themes in the store“. 1 Best Windows 10 skins and themes. 1.2 Android Oreo Skin Pack. 1.3 Game of Thrones Skin Pack. 1.5 iOS 11 Skin Pack. 1.8 Conclusion: Windows 10 Skins. Best Windows 10 skins and themes. For Windows 10, many custom themes and skins Available on skin-packs site. But In this article, I am going to list down some best free Windows 10 skin. The installation process is same for all skins and themes listed in this article. That’s why for the first theme only, I am going to tell you the installation process. If you like Windows features but also like Mac OS interface, then this is the best Windows 10 skin for you. 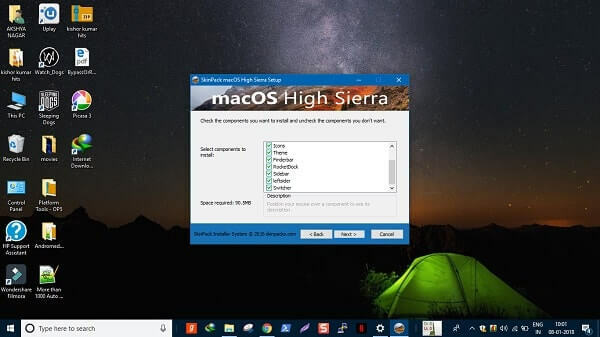 By Installing this skin pack, you can make your Windows completely look like Mac OS. It’s only skin, so your Windows feature will remain same. 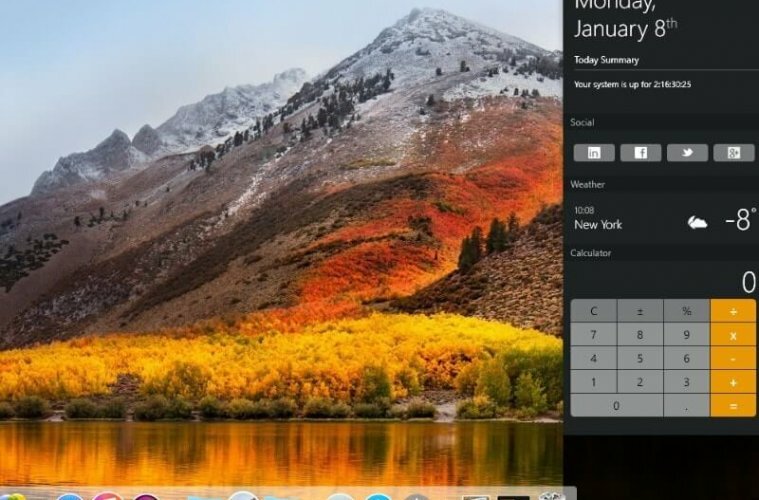 This skin will change your taskbar, with Mac OS app dock. Skin pack comes with Mac OS widgets, Which allows adding widgets on the desktop. This skin pack also available in three more color – dark, glass and black version. Mac OS icon pack also comes with this skin, Icon pack will change all your system apps and folders icons. App switcher option also available, Which will allow you to switch between four programs easily. The best part about this skin is, It works with Windows 7/8/8.1 and 10. So you don’t need to worry about which Windows version you’re using. Although, To run skin smoothly you need good specification Computer. To Download Windows 10 skins, First open skin pack link (Click on title for the link) and then you”ll get “Download it with ads for free” option. After that click on “skip and Download macOS high sierra skin pack” option. Now hit the download and click two times on skip option. To download Mac OS Windows 10 skin pack, you need to first download Skin Pack Downloader. And it will help you to download the setup file of skin pack. Note: Skin pack Downloader will ask you to install some third party software, So decline it. And setup will ask you for the password, Which is available on download page. After downloading skin pack you”ll get Install now option, Which will help you to Install complete skin Pack. Although, you can choose what thing you want to Install, and what not. – Once you are done installing the theme, You can access theme/skin pack in personalize window. – If you want to uninstall skin pack then open Control Panel > And go to “uninstall a program” option. If you like Android OS then this is the best Windows 10 skins and theme pack for you. Last year, Google launched Android Oreo OS and it is the best Android OS till now. This skin pack comes with Oreo UxStyle and theme, Icon pack and RocketDock. 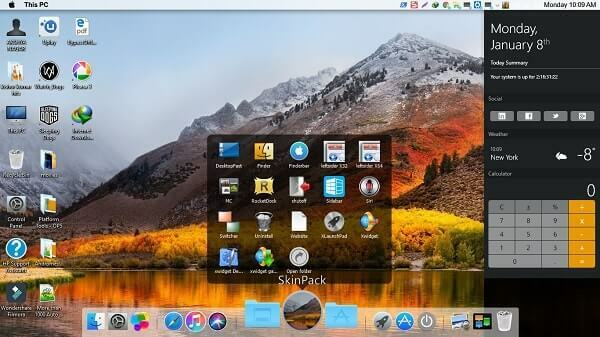 Rocketdock will replace your current taskbar, and somehow it is similar to Mac OS App Dock. 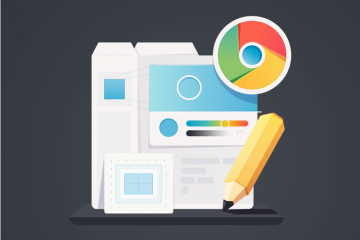 While installing this theme, Setup will ask you to choose components. Unmark PC Clean Plus option, Else third-party software can harm your computer. This skin pack will install Android Oreo Icon pack and will give you Android look in Windows. This theme and skin pack is also work in Windows 7/8/8.1 and 10. The installation procedure is same as Mac OS theme, So follow the same procedure. Game of Thrones Skin Pack. If you like watching English TV Shows, then you already know about best TV Show Which is “Game of Thrones”. And If you like this show, then you can try out this skin pack. 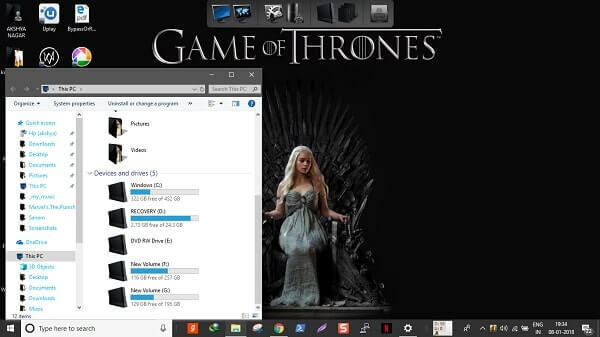 Skin pack will change your desktop wallpaper with “Daenerys Targaryen wallpaper”. And all folder and system Apps icons will change into GOT theme. The Best thing about this skin pack is mouse pointer and courser look. Mouse Pointer will change into hand sign and cursor fire. 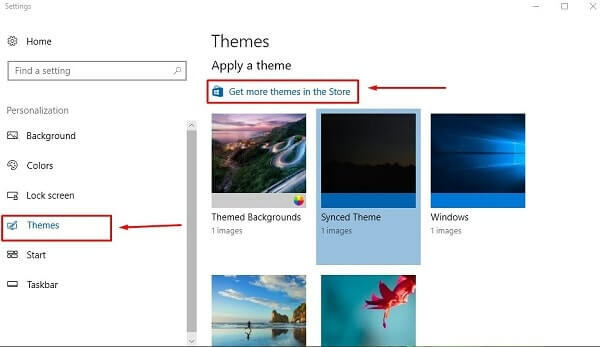 App dock feature also available, Which will not replace your taskbar, Will appear on above the screen. This theme works in all version of Windows, And Installation procedure is same. Overall, It is one of best Windows 10 skins pack that you can use. If you have decided to uninstall theme then after uninstalling, Use personalize option to switch back to the default theme. Because uninstalling from Control panel will not remove some features. If you are Linux user and currently using Windows OS. Then this is the best skin for you to get Linux look and feel in Windows. Ubuntu is one of best Linux Distro, And also a competitor of Windows OS. 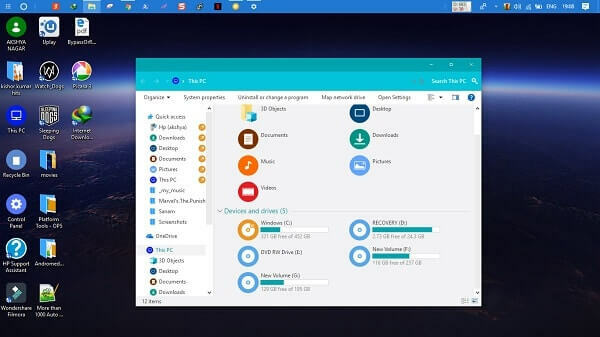 With this skin pack, you can enjoy Ubuntu UI and Windows feature without dual boot. With this skin pack you”ll get Ubuntu theme, Ubuntu App docks in the left sidebar. And like other packs, It also comes with an icon pack. 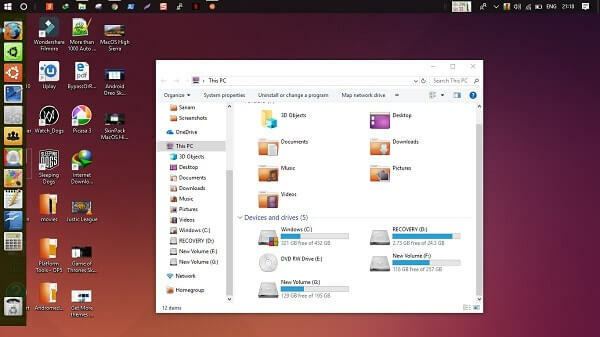 Ubuntu icon pack will get apply to Folder and system App icons. This theme also works in all version of Windows, even it’s available for Windows XP. After installing the skin pack, your taskbar will move to the top of the Screen. This iOS 11 skin pack is my favorite, Although I am an Android user it is better than Android skin. 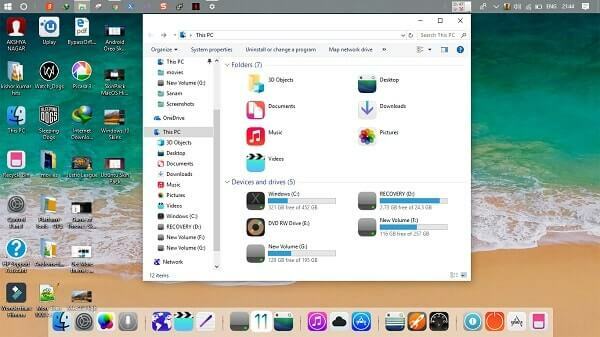 With this skin pack, you can get the iOS look and feel on your Windows Computer. Skin pack comes with rocket dock, Which will Replace your taskbar. And, your Windows taskbar will move at the top of the screen. You can access both things – Taskbar and Rocket Dock. This Windows 10 skins pack comes with iOS 11 icon pack. Which will get applied to your system and Folders Icons. Like every other skin packs and themes, It also works with Windows 7 and higher version. And if you don’t like Rocket dock of this pack then you can remove it. 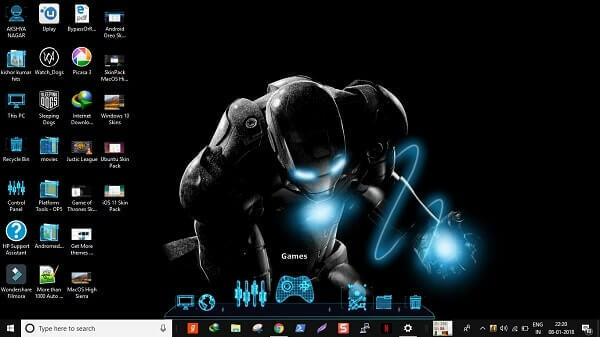 If you are Marvel fan and likes Iron Man then this Theme is for you. And this cool Theme is inspired by tony stark’s computing system Jarvis. This is the best custom theme and skin for Windows 10, Which will give a black and light blue look on your Computer. Jarvis skin pack also comes with App dock, Which allows accessing control panel, Computer, and network. The best part of this Theme is, It does not replace your Taskbar. Means, You can enjoy Taskbar and also can use App dock when you’re on the desktop. Skin pack also works with chrome browser, So your URL bar will turn into black. Icon pack of this theme is awesome, and background of Jarvis is also looking dope. If you ever Played this classic Game “Mario” then you”ll love this Windows 10 skin. This skin comes with App dock with Mario style icons, Which looks cool. 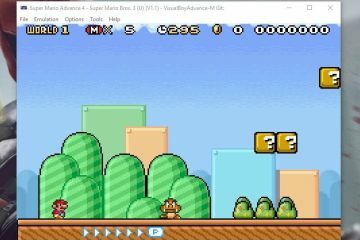 Mario Windows skins contain Mario background, Which will automatically get changed the time to time. Like every other Windows 10 skins, this theme also comes with icon pack, Which is OK but not Good. So, These are the some Best Windows 10 themes and Skins that you can Install. Still, dozens of Windows skins available, But these are the best. Almost all skins offer App Dock, But the best App dock is by MacOS skin. If you’re still confused which skin to download first then you can try Mac OS or Ubuntu skins. If you know about any other better skins then feel free to comment. Previous ArticleBest Apps to Earn Free Google Play Credit or Gift Card. Next Article100+ Best WiFi Names – Clever and Funny WiFi Names. Best GBA Emulator for Android, Windows, Mac and Linux. Fix Getting Windows Ready Don’t turn off your Computer. 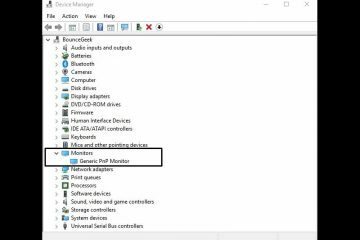 Fix Generic PnP Monitor Driver Problem in Windows 10. Xiaomi’s Mint Launcher released – How to Download. Get Google Chrome Dark Mode on Windows 10, Android.